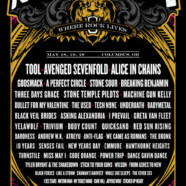 Rock On The Range General Admission and VIP tickets (including layaway options), as well as Hotel and Camping Packages, are on sale now atwww.RockOnTheRange.com. Fans are encouraged to buy early and save. Each ticket price level has a limited number of tickets available, so attendees can save more by buying earlier. Ticket prices will automatically move to the next price level once an allotment sells out. The ROTR layaway option also allows purchasers to split the ticket cost into four monthly payments. “We are looking forward to returning to Rock On The Range as a headliner this year and rocking out with all of you. Bring It!” said Jerry Cantrell ofAlice In Chains.